Professional Magicians were pleased to supply three of our top UK magicians for GFT at the 2012 awards this month. Dominic Reyes, Ben Williams and Michael Fairall entertained the nominees at the prestigious Grosvenor House Hotel in London's Mayfair area. 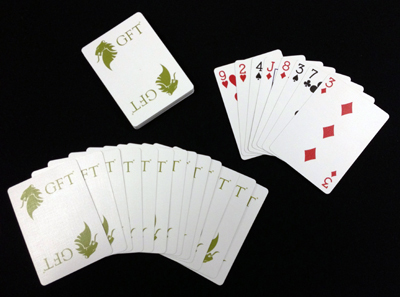 As the magicians were sponsored by GFT, they worn custom made trader jackets flown in from New York and performed amazing close up magic tricks with playing cards featuring the GFT branding. 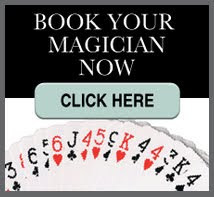 With several hundred guests to entertain, three magicians were the perfect choice. They were able to visit each table to entertain between courses and then mix with the guests after the awards into the night. Using magicians in these types of events, really helps to keep up the energy in the room. Award ceremonies can be rather long sometimes, so using magicians not only breaks the ice and gets people talking, but also creates a playful feel to the evening. Adding in a companies branding to the playing cards used by the magicians is a must. The magicians often have a card signed by one of the guests in the process of a trick, and it's given to them to keep. These cards REALLY do get kept and shown around the office after the event! We were really pleased with the feedback we got from the event. The client reported that the magicians were one of the highlights and that guests had been telling them how amazing they were all evening. Well done guys!